Protestants are making phenomenal gains in Latin America. This is the first general account of the evangelical challenge to Catholic predominance, with special attention to the collision with liberation theology in Central America. 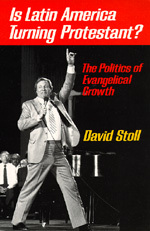 David Stoll reinterprets the "invasion of the sects" as an evangelical awakening, part of a wider religious reformation which could redefine the basis of Latin American politics.